Most of you know me as the designer of Sway's and the owner of SwayLand. You like my blog and you'd like to send me your items? Please do so. 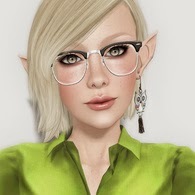 I'm always interested to see whats new and what creative and great items are all over SL. I accept review copies, and would be honored to be put on your blogger list. I’m not obligated to blog what you send me. I blog what I like and what fits my style. I am interested in everything from shoes to hair, accessories and fashion, for girls and guys. I appreciate when items come with a note with LM and information.